Our students and we agree this past workshop with Larry Jackel on Yamadori, was the best ever! We plan to have Larry back here at Plant City Bonsai in October, 2015 to continue teaching the art of styling and repotting of everyone’s Yamadori as well as work on new material. These Yamadori are old collected trees from the mountains. Our trees used for class were collected from the Rocky Mountains in Colorado and were approximately 100 years old. The method of enhancing and creating beautiful Jin and Shari (dead wood) was demonstrated by Larry during class and students utilized these techniques on their own trees. The end results were amazing and inspiring! 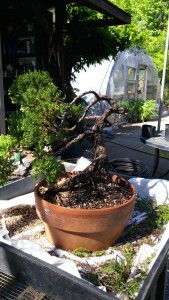 Some students preferred to work on our mature junipers rather than the Yamadori. They were able to recreate the look of ancient trees through the process of wiring branches and creating deadwood with carving and jinning tools. If you are interested in this October, 2015 workshop, rest assured this class is suitable for the seasoned bonsai enthusiast or novice. Larry makes it exciting and easily understandable for all. CALL US TO GET YOUR OWN YAMADORI! Let us know soon because we will be placing our Colorado order shortly.